LEGAZPI CITY (Jan 22) - Intensified lava flow was voluminously flowing than before feeding the advancing Miisi lava flow anew and feeding two new lava flows was observed on the Bonga Gully and upper Buyuan watershed. This was disclosed by Paul Alanis-Science Research Specialists of the Philippine Institute of Volcanology and Seismology (PHIVOLCS) in a press briefing here Monday. 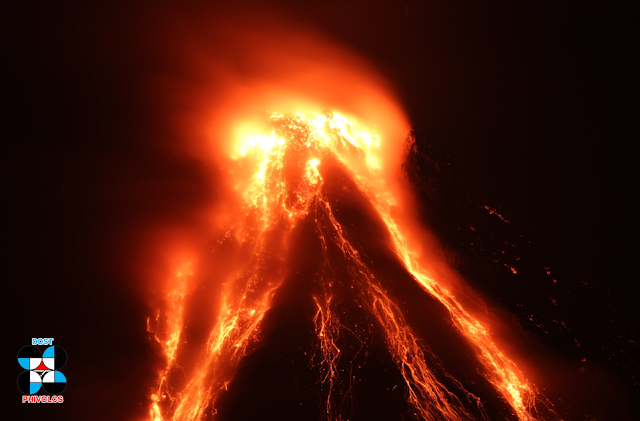 He said that the two high-lava fountains that occurred 10:45 PM Jan. 21 and 2:25 AM Jan 22 signified an increase in mass eruption rate and ash plumes rose about 1,300 meters above the summit. The ash plumes were drifted southwest and ash fall was experience in Barangays of Óas, and Guinobatan. Currently, the Miisi lava flow has advanced beyond three (3) kilometers from the summit crater well within the Permanent Danger Zone (PDZ).